The Rev. Elena Larssen has served as the 13th installed Senior Minster of The First Congregational Church of Long Beach (United Church of Christ) since 2013. A graduate of the University of California at Santa Cruz and Pacific School of Religion at the Graduate Theological Union, Rev. Larssen studied theater at Occidental College. Ordained to the campus ministry at Stanford University, she previously served two local churches as Associate Minister (Palo Alto, CA and La Grange, IL) and was Associate Conference Minister for the Minnesota Conference from 2008 to 2013; in that role, she was the youngest regional executive in her denomination. Nationally, Rev. Larssen is a Presidential Fellow of her denomination, Vice President of the Board for the Christmas Fund, and deeply engaged in leadership development for new clergy. Locally, Rev. Larssen is actively engaged with CCEJ, Clergy and Laity United for Economic Justice, and member of the current class with Leadership Long Beach. She is passionate about the power of congregations of all faiths to fight poverty, keep the arts alive, and build a just and tolerant society. Rev. Larssen is married to the Rev. Mark Pettis; they have one son and a basset hound. The Rev. John Forrest Douglas joined the staff of First Congregational Church of Long Beach in March of 2013, after serving on the staff of a church in suburban Washington, DC. As Associate Minister, John Forrest leads our Faith Formation programs for children, youth, and adults, is our primary pastoral care provider, and provides leadership during services. 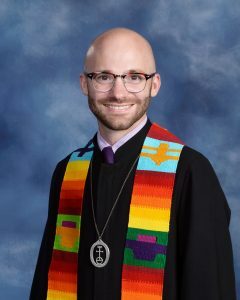 John Forrest has a Masters of Divinity from Wesley Theological Seminary in Washington, DC and a Bachelor of Arts from Millsaps College in Jackson, MS. Prior to his ordination, he served as a caseworker for individuals experiencing homelessness. John Forrest is concerned about the ways our faith affects our living and, in turn, makes our world a little more just, kind, and loving. When not at church, you may spot him walking his dog, Remy, at Rosie’s Dog Beach, riding a bike down the coast, or exploring the local restaurants with his husband, Ben. Curtis Heard received his bachelor of music degree from Cal State Long Beach where he studied piano, composition, and choral directing. Since 1992, he has been Choir Director at Woodrow Wilson Classical High School in Long Beach. He is also plays the piano, celeste and keyboard for the Pacific Symphony. Curtis has been involved with church music for as long as he can remember, first as a member of the children’s and youth choir at Hawthorne United Methodist Church, and later as a choir director and pianist. He began his church directing career at La Habra United Methodist Church. He then was the Choir Director and Handbell Choir Director for fifteen years at Bixby Knolls Christian Church in Long Beach. In 2005, he became the Choir Director and Organist at Aldersgate United Methodist Church in Tustin. In 2009, Curtis was music director for Brundibar, presented by CANTO in association with the Long Beach Opera. He has been the music director of numerous musical theater productions including Gypsy, Oklahoma, Anything Goes and You’re a Good Man Charlie Brown. 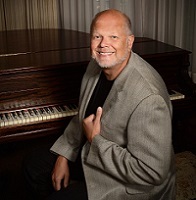 As a pianist/keyboardist, he has performed with the Pacific Symphony, the Cypress Pops Orchestra, Musical Theater West, the Long Beach Mozart Festival, South Bay Civic Light Opera and other musical organizations. He is also in demand as an accompanist for vocal and instrumental recitals. Curtis has written numerous compositions for choir, solo piano, organ, chamber ensembles, and the theater. He was a recipient of a COLA grant for his one-act opera, Permissable Union, premiered in 2010 at California Plaza in Los Angeles. Another of his operas, The Last Resort was performed at the NOW festival at the Redcat theater at Disney Hall. His choral compositions have been performed by the Notre Dame Glee Club, the University Choir of Cal State Long Beach, The Long Beach City College Women’s Chorus, the Singer’s Club of Cleveland and the combined honor choirs of the Long Beach Unified School District. He has collaborated with performance artist Ken Roht on several shows, including An Enjoyable Evening with Three Special Girls, Larry Swell’s Big Bang, Seven Seals and a Riding Monkey, Growing with Ghosts and the 99-cent only productions. Other theatrical works include the opera, Knight of the Dark based on the secret society of the Knights Templar, Harry Thaw Hates Everybody for the Mark Taper New Works project, and Leopold and Loeb, a Laugh Riot! (LATC and Seattle’s On the Boards Theater). His compositions also include several published choral works, piano and organ pieces, an Easter Cantata for Choir and Woodwind Quintet, handbell music and other chamber pieces. Curtis’ wife Lisa Bode Heard has been our congregation’s alto soloist for over twenty years and their son Clayton is an active member of our youth group. Curtis enjoys spending time with his family, camping and hiking, cooking, attending the theater, the Long Beach Aquarium, and the Huntington Gardens. Curtis is also an avid fan of the New York Times Crossword Puzzle, and the Angels. Wherever the worlds of music and children intersect, you might likely find a connection with Tracy Halter-Balin. She has a bachelor’s of music degree and credential from California State University, Long Beach in music education. Since the late 80s she has been the smiling face behind First Congregational Church’s children’s music program. She currently directs the All Seasons Choir, All Seasons Continued, the Beloved Bells youth handbell ensemble and Bellisimo, our adult handbell choir. She also oversees the Charming Chimes children’s group, sings in the Sanctuary Choir and loves playing guitar in the All Seasons Strummers. She has organized youth music tours, plays and appearances at music conferences, in addition to helping plan music for the year’s morning worship services. Tracy is also active at the Southern California/Nevada UCC Conference level as an adult advisor for the Youth Roundtable, attending meetings and volunteering at winter and summer camp experiences. Outside of the church walls, Tracy has been ringing handbells for 25 years and is a member of Pacific Bells Handbell Ensemble. She also loves singing with Avocation, a female quartet that includes her two cousins and a great friend. As time permits, she enjoys teaching piano lessons. As for her working life, Tracy has been helping out at Halter & Associates for the past few months and is starting a new adventure as the office manager and co-owner of an auto repair shop known as Matt’s Imports. Dr. Marc Dickey has been organist at First Congregational Church since December 1992, serving as the principle keyboard player for worship services, as well as participating in numerous recitals and other special musical events. In addition to his duties at First Church, he has performed as organist in the Long Beach Bach Festival, the Long Beach Mozart Festival, and for Temple Israel ‘s High Holy Days. He has given at least one annual brass and organ recital with brass students from California State University, Fullerton annually since 1990. Dr. Dickey has served on the faculty of the California State University, Fullerton Music Department since 1988, where he has been Chair of the department since 2005. Dr. Dickey oversees and coordinates CSU Fullerton’s highly regarded instrumental music teacher training program. He also oversaw the re-envisioning and installation of E. Power Biggs’ “Cambridge Portative” Schlicker touring organ in CSU Fullerton’s Meng Concert Hall in 2012. He holds Ph.D. and B.M. degrees from The University of Michigan, and the M.M. degree from Northwestern University. He previously served on the faculty of Oregon State University as Associate Director of Bands and a specialist in music education. In addition to his keyboard abilities, Dr. Dickey is a professional bassoonist, having performed with the Harrisburg (Pennsylvania) Symphony Orchestra for several years. He has worked with public school instrumental music ensembles from 24 states and three Canadian provinces and has published his research in several significant research and professional journals. Ruth Warkentin has worked in the office at First Congregational Church since 2000. 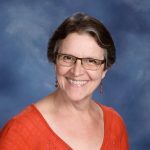 Her duties include editing the newsletter, keeping the church calendar, booking events for outside groups, updating the website, coordinating mailings, and maintaining the database. She holds an M.A. in English from the University of California, Irvine and is a member of St. Luke’s Episcopal Church in Long Beach. Facilities Coordinator, Yvonne SaMarion joined the church staff in April 2003. Her chief responsibilities are making sure that rooms are set up for various events and classes. She schedules custodial help for the facility and tries to ensure that everything remains in working order. A native New Yorker, she received her Bachelor of Arts degree with a major in biology, from Fisk University in Nashville Tennessee. She has done advanced coursework in wildlife management and, more recently, in early childhood education. She moved to Los Angeles in 1979 to take the position of trainer for a fast food company. She eventually became the training manager for their west coast region. She eventually left the position to work with young people from the inner city as a director with the Los Angeles Conservation Corps. She is an avid reader, an active participant in the choir and has been a member of several boards and committees within the church.